Last year I made the easy decision to stop straightening my hair. I was tired of spending an hour under the hair dryer and suffering through hell fire to blow the curls out only to have those rebellious corkscrews spring right back to life within hours. I was so over it! I just decided to let my curls fly free instead of fruitlessly trying to tame them and after talking about it for a year, I finally booked an appointment at a semi-fancy salon (instead of heading to the usual Dominican locales) for a hair cut that would suit my hair type. Nothing drastic because change makes me hyperventilate, but just enough to add a little bounce to my tired look. 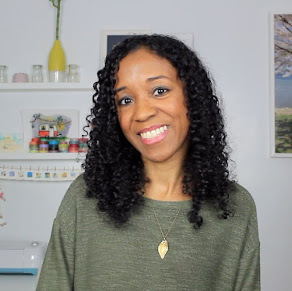 Because this was my first time sitting in with someone who knows how to deal with curls, I took the opportunity to ask my stylist CeCe at the Scott J Aveda Salon on East 86th Street for her tips on keeping them healthy. 1. Check the ingredients on your product labels and stay away from ones that contain alcohol. Curls are naturally on the drier side so even though your conditioner makes them feel smooth (due to the waxes in the formula), using mousse, gel or leave-in conditioners with alcohol afterwards will zap hair of its moisture and leave it feeling brittle and looking dull. 2. Try to go as long as possible without washing your hair. Constant washing and harsh chemicals in some shampoos can damage your curls and also leave them feeling dry. That's not to say walk around with a stinky head because by all means DON'T, but wait about three days if you can before rinsing them out again. 3. CeCe suggests cutting your ends every six to eight weeks. Not only does this keep growing hair healthy, but curls that grow too long can look lifeless too. Mind you I hadn't cut mine in over a year and my curls stretched out to reach the small of my back so I was long overdue for a snip. Only a couple inches was enough (I have this fear of looking like a child if my hair length is above my shoulders) and I was really happy when my hair felt so light and bouncy on my way out the door. 4. Layers also help add shape and volume to curly hair. My previous layers had grown out long ago and because my hair was all fairly the same length, I'd have a flattened top and all the curls weighing my hair down at the bottom. Not exactly the best look. 5. You know what else weighs hair down? Too much product. And knowing this I still use palm-fuls of leave-in conditioner. That's how scared I am of looking like an upside down mop. I kept asking CeCe, "Are you sure you don't want to put a little more on there?" and my body tensed up each time she'd run her fingers through to scrunch and fluff. Yes, my hair grew a bit more on that humid afternoon in the park and yes, I'd definitely put more curl enhancer in my hair, but I was surprised at what so little managed to do. 6. Before going out into the elements (and either before or after you style your hair), remove some of the moisture to reduce future frizz. Know that a diffuser is not for everyone. 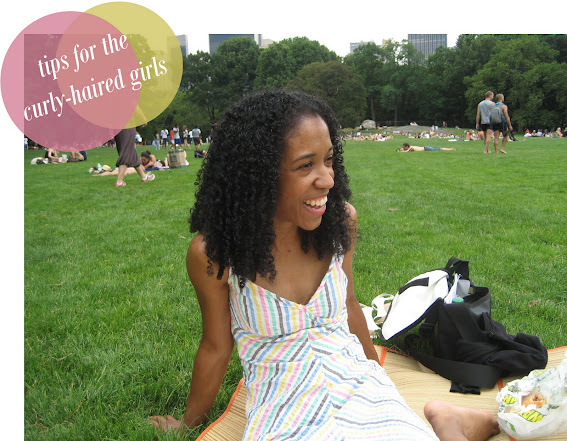 Depending on your curls, it could either gently circulate warm air around the strands to leave you with dry and soft ringlets...or it could crank up your hair's volume up to 11 and leave you looking like a Fry Kid. That's exactly why I stick with simple air drying (though the results are hard to control) or wrap my hair in a linen tea towel for a few minutes as soon as I step out of the shower. CeCe stuck me under a futuristic-looking infrared heat lamp for no more than 10 minutes and my hair was completely dry! 7. When you apply your styling product, it helps if you twist some of the curls around your finger to help define them. When you're done, do. not. touch. them. Tell your grabby boyfriend, too. If you want to avoid a frizz attack, it's best if everyone keeps their dirty, oily hands to themselves and just let them be. At least until they're dry and then I say all bets are off because really, what's the point of having a head full of beautiful loose curls if no one is allowed to enjoy them? I have wavy hair but not wavy in the right places. My hairdresser likes to style it wavy/curly but every time I try to recreate it at home I look slightly insane. But I am trying to change by scrunching it up for a slightly bed-tossed look rather than flat ironing it into submission. kelly, I'm not either! If I could have great-looking hair without doing a single thing that'd be awesome. intense guy, Thanks! The second one was actually taken by A. in October during our trip to D.C.. So it's not a recent one, but I like the semi-tamed wild bedhead situation I've got going on there. yvonne, your post was great! I follow some of those steps myself like only combing out the tangles with a wide-toothed comb while my hair is sopping wet with conditioner. I've also cut back drastically on brushing my hair back into a ponytail. It was turning the top of my hair straight (even after washing it) and the rest curly. I'm trying to leave it all lose so it's curly throughout. mandy_fish, I'm still scared of tossing and flipping and adding too much volume to mine only because it's so susceptible to having it grow a lot. A. loves the wild look, but I'm still getting used to just letting it out without stressing over it. It's all in the attitude, too. One time I was feeling really ugly cause my curls just wouldn't stay put and minutes later this tall, beautiful Black woman came strutting down the subway platform with this huge curly fro/mane. She looked amazing! That shut my brain up real quick. I definitely like you with more curls. It looks very nice in that top picture. you look so happy and gorgeous in that top photo, dorkys! definitely love your curls. chicagolady, Thanks! I like me with curls, too. I have very fine, thin naturally curly hair. I've been using a product called Frizzbusters (By Fantasia) for about 8 years now and I love it. It's a serum, and a little goes a long way! Best $8 I ever spent!